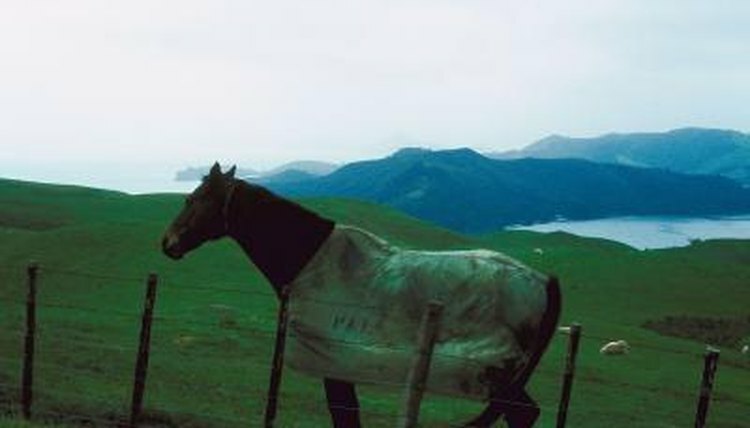 Horse blankets keep horses warm and dry when temperatures dip. Show horses who do not grow thick winter coats, or those who are unable to grow adequate coats to keep them warm, benefit the most from wearing blankets during cold weather. Horse blankets take a lot of abuse, especially when horses are turned out in them daily or wear them 24/7 for weeks on end. Horse blankets can take a lot of abuse, and they can get very dirty in the process. It is common for the inner section of a horse blanket to wind up covered in fur and grime from your horse's coat. The outside of the horse blanket will wind up covered in everything the horse blanket comes into physical contact with, including shavings, dirt, horse droppings and who knows what. A little bit of daily maintenance effectively minimizes the amount of grime that winds up stuck to your horse blanket over the course of the winter. Use a stiff horse brush to brush dirt and grime off the blanket on a daily basis. Spot-clean stains by spraying them with a spray-on stain remover and wiping or brushing the stain away. You can use products specially designed for horse blankets or generic cleaning products. It is a good idea to check your blanket for tears, rips or other damage on a daily basis. Horse blankets are large and bulky, making them challenging to wash. You can take a horse blanket to a professional cleaner if you live in an area where such a service is available. Otherwise, you will need to wash the blanket yourself. Use commercial or industrial capacity washers and dryers to wash your horse blankets or submerge the blanket in a tub of water with lots of gentle laundry detergent, and scrub it clean by hand. Hang your clean, wet blankets outside to air dry. The most common blanket repair involves replacing the straps that hold the blanket on the horse. You can order replacement straps if your horse breaks one or more of the straps. Horse blankets straps are either sewn on or they snap on the blanket. If a strap with a snap breaks, you can order a new one and simply snap it onto the D-ring the previous strap was attached to. If a sewn strap breaks, cut off the old strap off and sew a new one on. Patch tears in the blanket with new fabric. Most horse blankets can be sewn using a heavy duty needle, such as a carpet or canvas needle, and heavy-duty waxed thread. A sewing awl serves to push thread through particularly tough blanket fabrics.